Thomas Wright (1773-1845), Upton Hall, Newark; (+), Christie's, London, 7 June, 1845, lot 1 as 'L. Da Vinci' where purchased by Mr. Learmouth. By descent to his daughter, who married Charles George Sinclair, and by descent to his nephew, Henry John Sinclair, Lord Pentland (1907-1984), circa 1940, and thence by descent to the present owner. The present composition is one of many studio versions of a lost original by Joos van Cleve, inspired by a drawing by Leonardo da Vinci. Several versions of this subject exist by artists in Van Cleve's studio: see, for example, M.J. Friedländer, Early Netherlandish Painting, IX, Leiden, 1927, nos. 63a-c, e, i and k, pls. 78-79. One of these versions with a similar distant verdant landscape (Friedländer, op. cit, no. 63k) was sold in these rooms on 15 October 1992, lot 42 ($55,000). 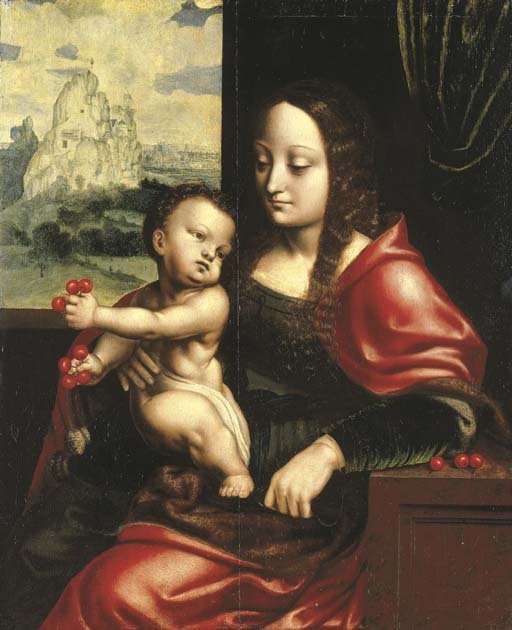 An attribution to Cornelis van Cleve has been suggested (see, for example, the Virgin and Child in the Alte Pinakothek, Munich; illustrated in Friedländer, op. cit., pl. 134, no. C.22).